Washington, D.C., June 20, 2012 –The National Security Archive announces the publication of its latest digital compilation of declassified records on U.S. ties with a critically important global partner – Japan. The new collection, Japan and the United States: Diplomatic, Security, and Economic Relations, Part III, 1961-2000, includes the most recent U.S. government releases covering a broad spectrum of issues and events in the bilateral relationship, and providing essential content for understanding the current global economic crisis as well as recent geopolitical developments in East Asia and the Pacific Rim. Japan and the United States makes available 902 documents dealing with high-level policy making within the U.S. government and the history of U.S.-Japan relations during the last four decades of the 20th century. These documents, obtained since publication of the second set on U.S.-Japan relations, which covered the years 1977-1996, supplement those found in the first two collections and extend the scope of the set to include the Clinton administration. The compilation includes records of U.S.-Japanese summit meetings; communications between heads of state; top-level internal deliberations; memoranda, cables and studies concerning U.S. diplomatic relations with Japan; records concerning the U.S.-Japan security relationship; documents related to trade and international monetary relations; and intelligence estimates and studies concerning Japan’s foreign policy objectives, military capabilities, economic policies and internal situation. Challenges on the Korean Peninsula, including efforts to promote better relations between Tokyo and Seoul, and the security threat posed by North Korea’s nuclear weapons program. The Japanese and Asian economic crises of the 1990s. This briefing book provides the schedule of events, background information, objectives, and other materials that were used in preparation for the eleventh Japan-U.S. Security Subcommittee meeting, a forum for exchanging views on a regular basis that became increasingly important after the two nations adopted the Guidelines on Defense Cooperation in 1978. The topics covered include briefings for the Japanese on the second round of Strategic Arms Limitation Talks (SALT II), NATO, the Middle East, the security situation in East Asia, joint military planning, the U.S. presence in Asia, defense cost (or burden) sharing, and defense technology cooperation. Among the key U.S. goals for the meeting were to reassure Japan that the US would remain a Pacific power while encouraging Japan to make a greater effort in the security sphere; to increase Japanese awareness of mutual global security concerns in connection with SALT; the Middle East (centered on access to oil); Southeast Asia; relations with China; and the growth of Soviet conventional, particularly naval, power in the Pacific and Indian Oceans. This nearly verbatim account of the Japan-U.S. Security Subcommittee meeting illustrates how the U.S. representatives pursued the wide range of issues and goals outlined in the briefing book above. Among the interesting points are the clear signs of continued Japanese concern about a future U.S. military presence in the Pacific/East Asia; the U.S. interest in drawing the Japanese into discussion of possible increased Japanese security spending and commitments, particularly the delicate issue of Japanese contributions to peace-keeping operations (which would become more urgent during first Gulf War, as shown in documents below); and an exchange of views on the possibility of a North Korean attack, with Japanese intelligence assessments indicating that Pyongyang might attack if it could get Soviet or Chinese support. Another topic that would become more pressing in the decade ahead was the different U.S. and Japanese views regarding joint development vs. purchase of military technology, with a particular focus on the next generation of fighter aircraft, in which are visible the seeds of the FSX controversy. This telephone call marks the start of Bush’s personal diplomatic effort to secure support and a financial contribution from Japan for the nascent coalition against Iraq. In discussing possible sanctions against Iraq and the freezing of Iraqi and Kuwaiti assets, Bush acknowledges the Issue of Japanese dependence on Middle East oil is as a critical factor for Kaifu. In this conversation, Kaifu informs Bush of the economic aid that Japan will deliver to Egypt, Jordan, and Turkey as result of the Persian Gulf Crisis. Bush welcomes this news, stressing how it will provide good ammunition against critics in Congress who have been taking America’s allies to task for failing to contribute to the cause. After several exchanges by telephone, Bush and Kaifu are finally able to meet in person to discuss the Iraq crisis as well as other issues. The conversation ranges from Tokyo’s support of U.S. troops stationed in Japan, to the Uruguay Round of trade talks, and other topics. Bush continues pressing Kaifu on securing a Japanese contribution to the military effort, as well as on increasing host nation support for U.S. forces in Japan. The talk also turns to relations between Tokyo and Moscow, and Kaifu’s hopes that the upcoming visit by Soviet leader Mikhail Gorbachev visit will create an opening on the Northern Territories issue and the long-postponed peace treaty marking an official end to hostilities between the two countries after World War II. In this memorandum, Treasury Under Secretary Summers details the signs of an impending economic recession in Japan, including the consequences for the U.S., and makes recommendations for addressing the situation. Summers calls for the U.S. to give more attention to its dialogue with Japan on macroeconomic issues, including a meeting between Treasury Secretary Rubin and Japanese Finance Minister Takemura during an upcoming meeting between President Clinton and Japanese Prime Minister Murayama at the Halifax G-7 summit. The attached memo discusses fears that a “1930s-type scenario” could unfold in which high interest rates, deflation, rising unemployment and yen appreciation reinforce one another; it further lays out a possible, if not probable, worst-case “black hole” scenario, noted in the introduction. To address the current situation, [tk: according to whom??] the U.S. needs to press Japan to use monetary and fiscal policy more aggressively to reduce the risk of an economic free fall. In this memorandum, a follow-up to the one noted above, Summers provides Rubin with a detailed report on U.S. efforts to persuade Japan to take effective steps to head off an economic crisis in the country, including a detailed account of Timothy Geithner’s meetings with Finance Ministry and Bank of Japan officials. As an attached memorandum from Geithner summarizes the situation in Japan, there is “deep pessimism” in Tokyo about the economy, and the combination of political constraints and a cautious Ministry of Finance and Bank of Japan may continue to work against urgent and aggressive action. Rubin’s final judgment on the effort seems more resigned than optimistic: “we’ve done everything we can do” to affect the situation. In this memorandum, Geithner briefs Rubin and Summers on the main issues for the upcoming meeting with Japanese Finance Minister Mitsuzuka. The list of American concerns (which sound oddly familiar in light of more recent and widespread economic and financial woes) includes Japan’s economic future, banking system, financial reform, and anti-corruption efforts. For example, the U.S. fears that Japan’s banking system is being weakened by the overhang of bad loans and so was vulnerable to another economic downturn. Geithner also advises Rubin and Summers to continue pressing Tokyo on financial reform and deregulation to create opportunities for foreign business, while improving transparency and disclosure measures to reduce risk for foreign investors. The U.S. had a clear interest in the success of the “Big Bang” financial reforms, as U.S. firms would benefit from the greater ability to market new products and services in Japan, the relaxation of foreign exchange controls, deregulation of asset management and the expanded use of derivatives (though in hindsight the latter may not have been so wise, given the role of risky derivatives in creating the more recent economic crisis). In this memorandum, Geithner briefs Summers for his upcoming meeting with Japanese Vice Minister of Finance Eisuke Sakakibara. 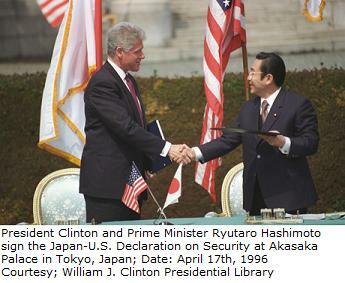 The document provides a good overview of U.S. policy goals regarding Japan during Clinton’s first term and for his second term. Echoing points made in the April 1997 memorandum noted above, Geithner notes that recent data reveal problems with Tokyo’s strategy of relying on domestic demand to tackle economic problems. An attached paper says that the U.S. faces two major risks with Japan: a rising current account surplus that could spark political tensions in the face of closed Japanese markets; and spillover to the international financial system if the legal, regulatory and supervisory environment is not properly revised to deal with issues rooted in the “Big Bang” opening of Japanese markets to the world. In a portent of things to come, Thailand’s economic problems indicate the possible spread of economic ills beyond Japan; i.e., signs are emerging of what would become the Asian Economic Crisis of the late 1990s. This cable reports on Secretary Albright’s exchange of views with Japanese Foreign Minister Koumura about the upcoming Group of Eight summit in Okinawa (where Albright hopes Japan will take a strong leadership role) and the Asia-Pacific Economic Cooperation meeting in Auckland; U.S. relations with China; and issues regarding Taiwan and Iran. Albright also discusses U.S. steps to get relations with Beijing back on track after the accidental NATO bombing of the Chinese embassy in Belgrade on May 7, 1999, during Operation Allied Force, when five U.S. bombs hit the embassy, killing three Chinese reporters. Albright refers to efforts to give the Chinese “a means of getting themselves out of a corner.” Towards this end, Albright tells Koumura that the U.S. has provided China with a factual account of what happened, and that CIA Director George Tenet and his agency have taken responsibility for the mistaken targeting. This and the following document provide a window into the policy goals and concerns preoccupying the U.S. as the security relationship with Japan headed into a new century after marking the 40th anniversary of the 1960 Mutual Security Treaty. As DOD official Franklin Kramer heads into the meetings, the alliance remains the centerpiece of U.S. regional security and Japanese national security strategy. Among the U.S. goals for the meeting are: starting a strategic dialogue looking to the new century; exchanging views on China; and stressing the relationship of trilateral activities (i.e., U.S.-Japan-South Korea) to enhanced regional cooperation. In this connection, Japan-South Korea defense relations are improving, with moves being made towards establishing real security ties, including joint exercises in 1999. This document provides more details on the U.S. goals and concerns surrounding the future of U.S.-Japan security cooperation in the 21st century. The broad areas of concern include the long-term dialogue with Tokyo on the future of the alliance, China, and regional cooperation in Asia on security issues. Regarding the future of the alliance, the Pentagon wants to use Japan’s Mid-Term Defense Plan and the U.S. Quadrennial Defense Review as the basis for a long-term dialogue. As the brief lays out the overall objective: “This is not about the U.S. asking Japan to do more as has been the case sometimes in the past. Rather it is about asking ourselves what kind of alliance will best serve as the foundation for regional stability for the next forty years.” One specific goal is to push Japan to increase its role in international peacekeeping. While the U.S. believes the region is becoming more accepting of such a Japanese role, Washington recognizes the uncertain public support in Japan for this, being well aware of the ongoing debate over the future course and nature of the country’s strategic role in the world. Regarding China, the brief notes again the efforts to smooth the waters after the accidental bombing of the Chinese embassy in Belgrade. Longer-term concerns are underscored by the tough political rhetoric in the recent China Defense White Paper, which will more likely feed rather than dampen those who are warning of a rising “China threat,” and the perception that the Chinese military is hawkish and pressing a hard line regarding the U.S., Taiwan and Japan. In part to address these concerns and, if possible, engage Beijing in a more cooperative relationship, the U.S. had launched the Asia Pacific Regional Initiative to support development of a regional defense initiative to promote multinational activities to address nontraditional security threats and contingencies. As the brief emphasizes, political, economic and social transitions in the region will produce new security challenges that cross borders and affect common security. Underscoring that multilateral initiatives will not diminish existing bilateral relationships, but will address the reality that any military action taken in Asia will have to be multilateral in nature, the brief also makes a point of noting that China is not to be excluded, but is a potential partner.